Jairrod A Burch was born in 1979 in the city of Canton, Ohio. Growing up he knew there was a great call on his life to help others reach their destiny no matter what situation surrounded them. Jairrod at the age of 15 years old accepted the call on his life to impact those around him and abroad through the gift of speaking. He started on stages, pulpits, and anywhere across the country where doors of opportunity opened to him at to speak life into those who would listen. It was a God given gift to speak, so he felt an obligation and responsibility to give his time, talents and passion back in a way that would aid others in discovering their purpose in life. “When your vision is bigger than you that’s when you know it’s your destiny”! Jairrod has been traveling the country for over 20 years reaching, teaching and impacting the lives of many by showing others both young and old that your true worth is in your DNA not just your ability to perform a task. Inspired by his own life’s struggles, trials and challenges Jairrod has been relentless in his quest to push, pull and propel others to rediscover and redefine their self- value. Value on Purpose is people realizing that people are valuable because that’s how we were originally designed. It’s not in our abilities or our talents but it’s in who we simply are. Valuable on purpose, with a purpose. 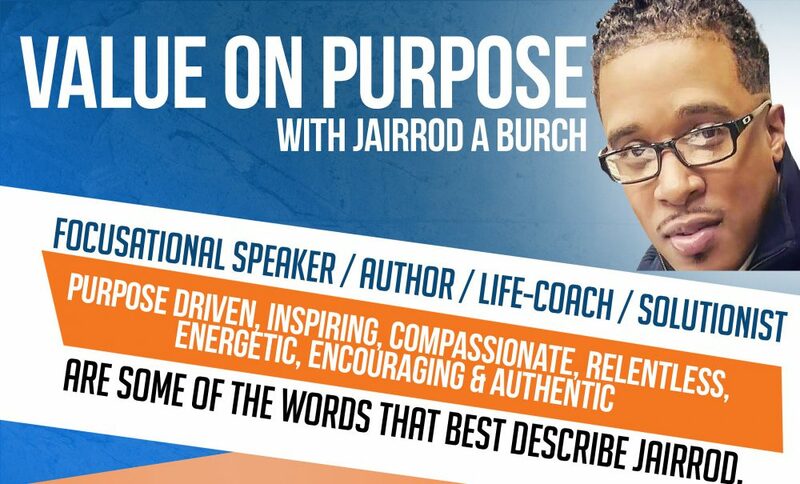 He is the CEO and founder of Value on Purpose with Jairrod A Burch, a global voice that is emerging throughout this generation. He is the founder of the “ACADEMY VICTORIOUS” in the Greater City of Indianapolis, In, which promotes healthy self awareness while discovering the power of knowing that mistakes do not have to become your final destination. Most importantly he is willing to make a difference by reaching out to those that seem to be the most forgotten.